The KD carp rig is the latest rig that I have chosen to write about as it is one of the most effective rigs around and also one of the most simplistic carp rigs around. This rig is called the KD rig simply because the person who invented this rig is a carp angler called Kenny Dorsett so its his initials that give the rig its name. The KD rig must be used with a curved hook to give it an aggressive angle and aid in the hook-up ratio, the only thing different about a KD rig to the knot-less knot rig is the way the knot is whipped around the hook instead of the hair coming out of the end of the whipping on the hook it comes out of the start as showed here. If I were to make a simple hair rig I would without a doubt use shrink tubing over the hook. 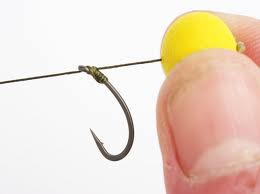 But if you use anything on the hook of the KD rig be it either silicone, shrink tube or a rig ring, it would ruin the purpose of the KD rig as it would take out the incredibly aggressive angle the hook. Whenever you use a KD rig it is best to use a balanced hook bait. Here are the ones I use. On the left is a balanced pop using a split shot. 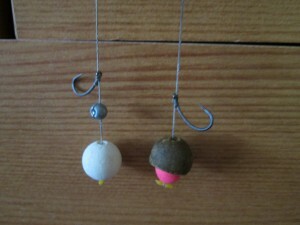 On the right is a chopped down boilie and half a 10mm pop which makes this a slow sinking hook bait. 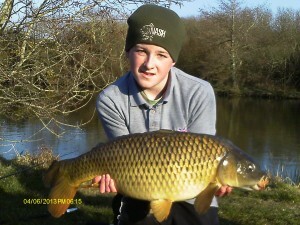 This Rig has caught me a number of carp small and big Including this lovely mid double Common. Nice informative article, very well written! I’ve never bothered with a KD rig but having read this would give it a crack!